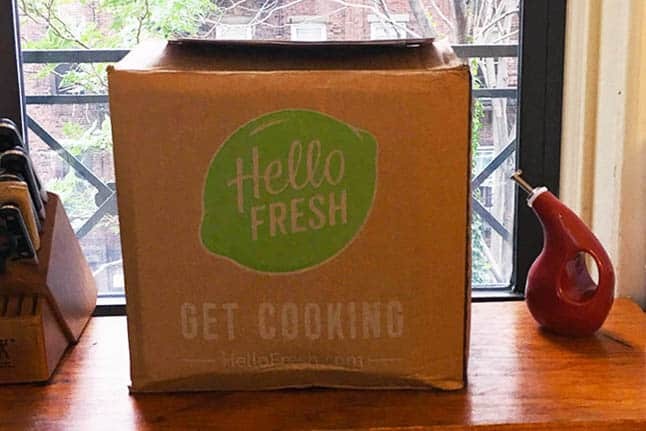 When it comes to meal delivery services, HelloFresh and Blue Apron are two of the biggest names in the game and it’s for good reason. These companies provide meal kits that deliver fresh, pre-portioned ingredients and detailed recipe cards. This allows customers to enjoy a delicious, home-cooked meal without the hassle of meal planning and prepping. Since these services are so similar, it’s only natural that you may have a hard time choosing between the two of them. That’s why we put this comparison together. What it really comes down to is the types of meals plans and dishes they offer, as well as the overall cost. To help you make the decision that’s best for your needs, this post breaks down everything you should know about both meal kits. This way, you can quit stressing about which one to sign up for and get a box full of fresh ingredients delivered to your door for next week’s dinners! When it comes to food, no one wants to be stuck eating the same type of meals over and over again. That’s why variety is key when it comes to meal delivery services. One of the best things about both HelloFresh and Blue Apron is that each meal delivery service has a rotating menu that changes each week. This way, you never get bored with your meals since you’ll always have a different selection to choose from. 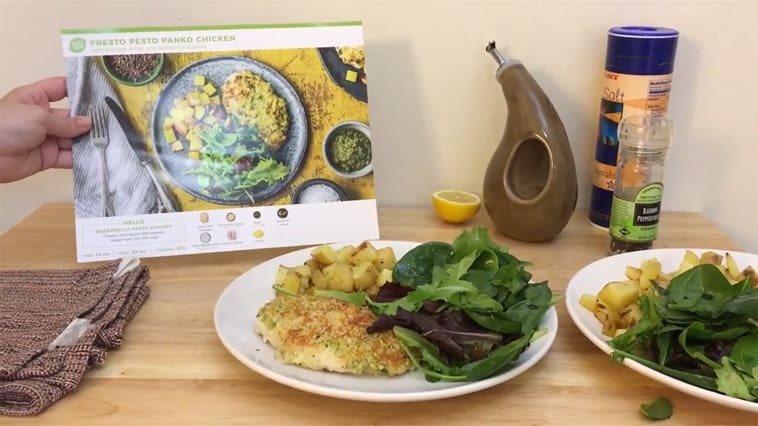 Currently, HelloFresh offers three different meal plans to choose from. Their Classic Plan is suitable for either two or four people and allows you to receive your choice of two, three, or four recipes per week. With this plan, meals wind up costing you $8.99 per serving. There’s also the Veggie Plan for any vegetarians who are looking to try out Hello Fresh. But it’s also a great option for those who simply want to have more meatless meals in their lives. The Veggie Plan can provide you with servings for either two or four people and will get you three recipes per week. There’s no option to change that. And like the Classic Plan, it will also cost $8.99 per serving. Lastly, there’s the Family Plan which is designed to feed four people. It’s perfect for a couple and their kids so the whole family can enjoy HelloFresh meals. You will have the option to choose from two or three recipes per week so you can make the service work for you. The meals will wind up costing $7.87 per serving. Should you choose to check out Blue Apron, you’ll discover that they have four meal plans to choose from. This allows you to easily customize the service to your needs. First, they have their Signature plan, which provides a two-person serving with each meal. This plan allows you to choose between two or three recipes per week. If you’re looking for meatless dishes, you can choose their Vegetarian plan. This option gives you two servings of each dish and you can receive two or three recipes per week. But if you need a little more, you can go with the Signature for 4 plan, which is suitable for families. It provides four servings and allows you to get two, three, or four recipes per week. And finally, there’s the Weight Watchers Freestyle plan. This plan provides two servings and you can get either two or three recipes per week. It’s ideal for anyone who wants easy recipes while still sticking to a healthy lifestyle and the Weight Watchers plan. As mentioned above, HelloFresh has two different options for portion sizes. You can go with either the Classic Plan or the Veggie Plan to receive enough servings for two people. This is ideal for a couple or an adult and a child. However, it’s also perfect for those who are dining solo because it’ll provide enough for leftovers the next day. 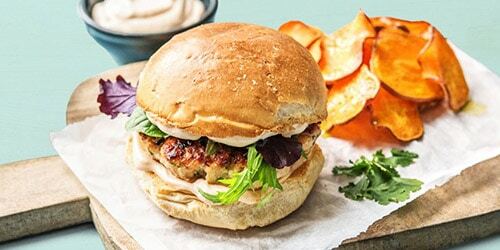 If you have a family to feed, you can go with any of HelloFresh’s meal plans, as each one provides a four-person serving option. It really depends on your needs and you can always make changes to your meal plan in the future should the need arise. 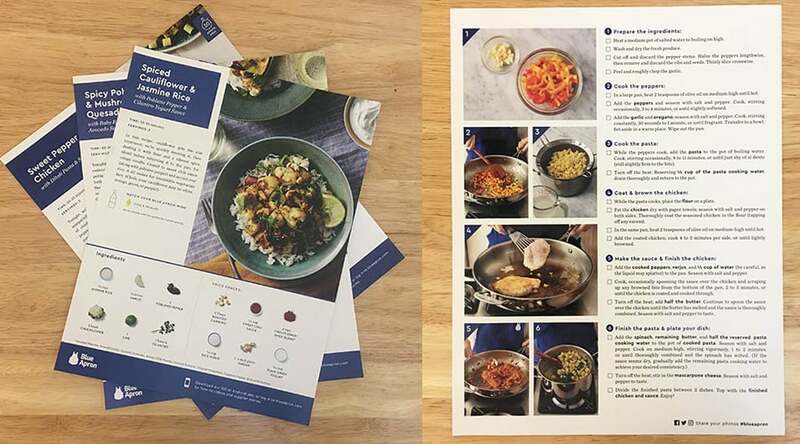 If you need enough servings for two people or if you’re flying solo, you can choose from three different Blue Apron meal plans. Their Signature, Vegetarian, and Weight Watchers Freestyle plans all provide you with two servings. All three of those plans will be suitable for you. It just depends what types of meals you’d like to cook each week. If you have a family to feed, the only option you’ll have is the Signature for 4 plan, which gets you four servings of each dish you choose. It should be plenty for your family to enjoy. As for the sizes, both tend to have nearly identical portions. Not too little but not too much where you’ll be left throwing away some of the meal. I recommend watching our Hello Fresh video and Blue Apron video to see a live example of us making each dish. Both HelloFresh and Blue Apron will send you pre-portioned ingredients to make your meals. These meal delivery services are not sending pre-made dinners to your door. Instead, you’ll receive all the essential ingredients you need to prepare a meal, along with a step-by-step recipe to follow. Since you’re preparing these meals on your own, you will be receiving recipe cards with each order from HelloFresh and Blue Apron. This way, you’ll have all the step-by-step details on how to bring your meal to life. You don’t have to worry about having your laptop or tablet nearby since everything will be printed on a handy sheet for you. Hello Fresh also includes a bonus card that gives you the exact nutritional information for each meal you’re making. Blue Apron does not give as much nutritional information or recipe details as Hello Fresh does. At this time, HelloFresh and Blue Apron deliver their meal kits across the contiguous United States. That means they are unable to deliver meals to Alaska and Hawaii at this time. However, you can always check back in the future to see if they’ve been able to expand delivery to your area if you’d like to join. Neither service requires you to be home at the time of delivery, which is a plus for those who are away at work all day long. You don’t have to worry about missing your meal delivery and since everything is packaged to keep food fresh, it won’t spoil before you’re able to get to it. HelloFresh charges their customers $6.99 for shipping, so you’ll want to keep that in mind when signing up. Blue Apron doesn’t charge extra for shipping on any of their plans. Meal kits are here to make your life easier. It’s important that their website and app makes ordering and keeping track of meals simple too. The Hello Fresh website is very simple to navigate. As a regular customer, you’ll see the screen above, where you’ll be able to make your weekly meal selections. It gives you a nice overview of the meal, an overhead photo of the finished dish, and an estimate of the amount of time involved to cook it. On some meals, you’ll notice that there is a “Hall of Fame” notification. These dishes are ones that have been ordered over and over again by Hello Fresh customers, and are known for being extra tasty. When you click on a dish, a pop-up will appear where you’ll be able to see more specific information on it. This will give you: allergens (e.g. wheat, milk, tree nuts), possible cross-contaminations (e.g. shellfish), prep/cook time, how difficult it is to cook, and calories. 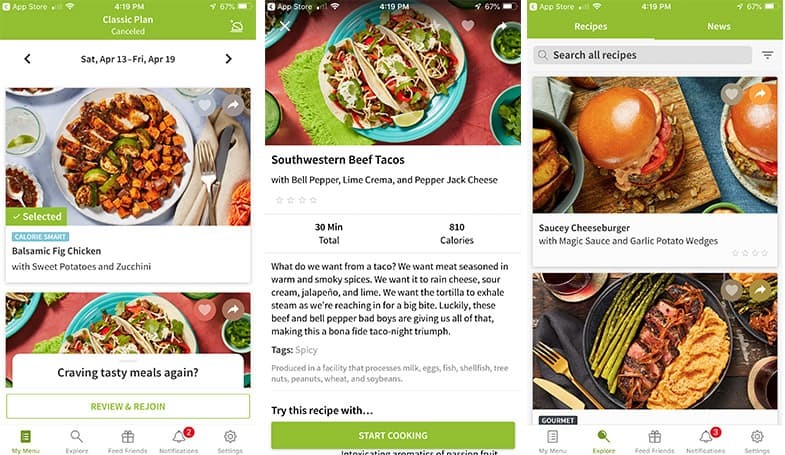 If you’d like, Hello Fresh even allows you to see the full recipes prior to receiving the meal. The Hello Fresh app (available on iOS and Android) is basically the same as their website. Of course, if you’re on your phone, it’s a bit easier to navigate. They do have an “Explore” section that allows you to see all of the trending recipes as well as news, which is just a feed from their blog. The Blue Apron website is setup very similar to Hello Fresh. You’ll see an overhead picture of the finished dish, estimated time to prep/cook, and a notification letting you know who likes the dish (e.g. customer favorite). One of the biggest noticeable differences is that you can make a different plan selection. If you click the dropdown menu, you’ll have the ability to select any of the plans that Blue Apron currently has available. The product details are also similar to Hello Fresh, they appear as an overlay. You’ll get more in-depth information on the dish as well as what ingredients are included to make the dish and you have the ability to view the full recipe prior to ordering. One drawback is that Blue Apron does not tell you any information about allergens or cross-contamination on this page. The Blue Apron app is setup similar to their website, with all of the same information. It’s also easy to navigate. 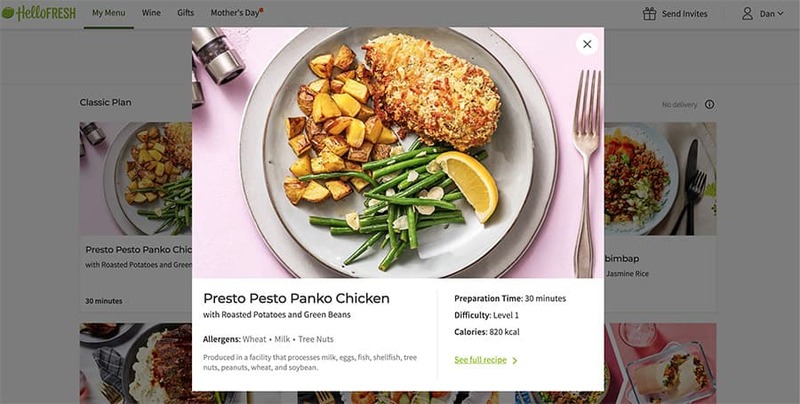 The meal selection is similar to Hello Fresh and they also have a section dedicated to allowing you to explore the different recipes. Blue Apron takes their app one step further, however, by adding a “Community Tips” section. It’s here that you’ll be able to see what past cooks have said about making the meal. Many give tips about how to make the perfect dish. Packaging is an essential element to a successful meal kit. Obviously, you want your meals to arrive cold and in good condition. Plus, you don’t want to go with a meal kit that creates a lot of waste as it could be a burden on the environment. Doing their part to be more eco-friendly, HelloFresh incorporates recyclable packaging into each and every box. The box itself can be dismantled and put out with all your other household recyclables. Their separator piece and the meal kits and 100% curbside recycling friendly, as is the honeycomb paperboard. Depending on the season, HelloFresh changes up some of their packaging to ensure everything inside stays cold. The liners used in the summertime can be taken to a nearby recycling center, while the winter liners should be thrown in the trash. If you want to dispose of the ice packs, simply cut them open with a pair of scissors, empty the water soluble contents into the trash can, and then recycle the plastic. 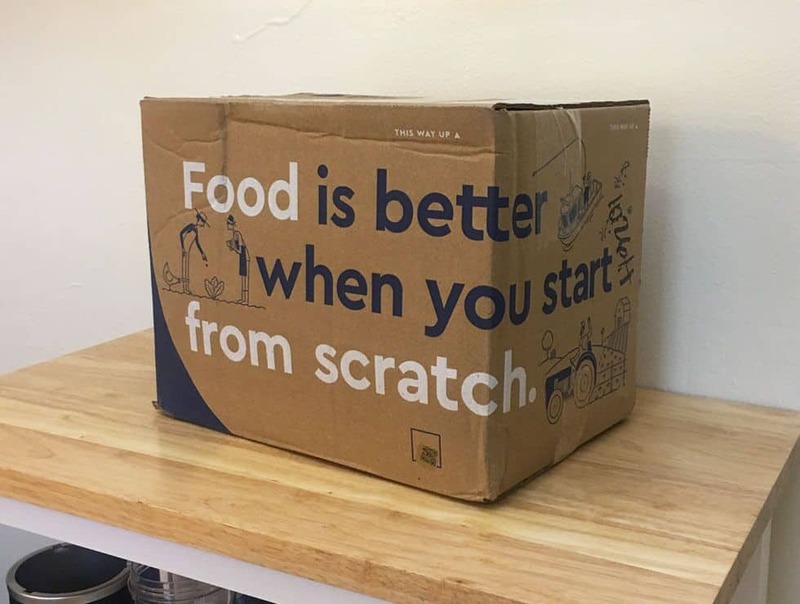 Much like HelloFresh, Blue Apron will also switch up their packaging based on the season. They also take your location and the box’s contents into account since all of those are important factors in keeping your food cold and safe to consume while it’s in transit. The box itself, other cardboard elements, and the ice packs (once drained) can be recycled. Blue Apron actually has a detailed recycling page that customers can find when logged into their account. This tells them exactly how to recycle everything in the hopes that customers will take this extra step instead of throwing things out. If you’re unhappy with your order from HelloFresh or Blue Apron, get in touch with them. Their teams are happy to make it right for you, as they want you to be satisfied with your meals. You just want to make sure you do so rather quickly. HelloFresh requires customers to get in touch regarding issues within five days of receiving the order, while Blue Apron’s time frame is seven days. That means you can’t wait around if you notice something is wrong! From there, you’ll either be issued a credit or a refund. It really depends on what the company feels is the best remedy to the situation and what the exact issue was. You could receive a full credit or just a partial credit if only one item was damaged or incorrect. If there’s ever a problem with your meal kit, you want to know it’ll be taken care of by customer support in a timely manner. If you need to get in touch with the team at HelloFresh, they have a giant FAQ section that has answers to popular questions on their website, so it’s a good place to start. If this doesn’t solve your problem, you have three different ways you can get in touch with them. They offer a live chat on their website, you can email them, or you can call them. You can even see the estimated wait time for each option so you can choose the one that’s best for you. To get in touch with Blue Apron, you can give them a call, send over an email, or use the chat box on their site. They don’t have the handy wait times displayed like HelloFresh does but they do have a section of their site dedicated to frequently asked questions. Would you like a nice glass of wine to go with that delicious dinner you’ve just cooked? Well, both HelloFresh and Blue Apron have gotten into the wine game! Each company sends six bottles of wine per month, giving you plenty of options to pair with your meals. HelloFresh sends 750ml bottles, while Blue Apron sends 500ml bottles. Which one is right for you depends on how much wine you like to drink and how much you want to spend overall. Since you’re getting a bit more wine with HelloFresh, you’ll pay $89 per month, while Blue Apron charges $65.99 per month for their wine service. See which meal kit and meal plan fits your budget best. Hello Fresh meals go as low as $6.99 per meal and as high as $9.99 per meal depending on which meal plan, meals per week, and serving size option you select. There are a lot of variations you can choose. For example, the classic plan for 2 people with 4 recipes sent per week would come out to $8.99 per serving. We recommend going to the Hello Fresh pricing page and inputing your specific meal plan preferences to see what the final cost would be. One thing to note is that Hello Fresh charges a shipping fee of $6.99 on every order, regardless of how big or small. 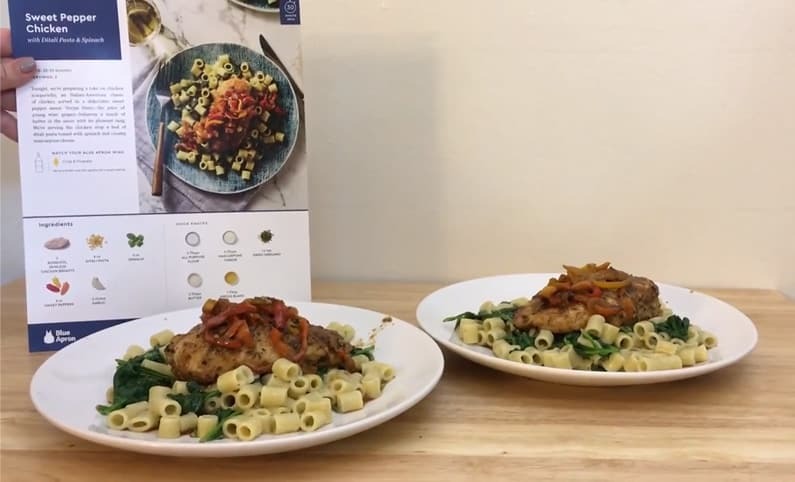 Blue Apron meals go as low as $7.49 per serving and as high as $9.99 per serving depending on which meal plan, meals per week, and serving size option you select. 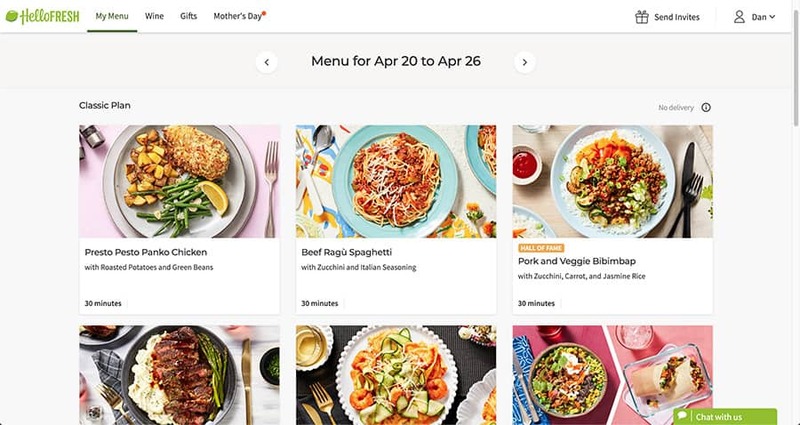 There are less variations you can choose since Blue Apron only has two meal plan options — Two-Person Plan and Family Plan — where as Hello Fresh has 3. We recommend going to the Blue Apron pricing page and inputing your specific meal plan preferences to see what the final cost would be. Blue Apron only charges a shipping fee of $7.99 on their Two-Person Plan when 2 recipes per week are selected. Both Hello Fresh and Blue Apron are, without a doubt, two of the biggest meal kits currently available. While they’ve both spent a lot marketing and advertising their meal kits, there is another reason why they’re so popular… They’re both great services. Choosing the one that’s right for you may be a tough decision, given the fact that they are pretty similar. I recommend looking over each of the points and prioritizing which one you value the most. For example, if you need to know specific nutritional facts about the meal, Hello Fresh is your best option. On the other hand, if you really don’t want to pay for shipping, Blue Apron is your best option. In terms of tastiness of meals, you can’t go wrong with either. In our many boxes that we’ve received from both Blue Apron and Hello Fresh, the meals we cooked turned out great. You want the most amount of money off of your first box. Hello Fresh typically runs the best coupons. You want to be able to see details regarding allergens and possible cross-contaminants prior to making your meal selection. You want the most detailed recipe card. You want a vegetarian meal plan. Blue Apron only has vegetarian options, not a dedicated plan. You want to have more meal plan variety. Blue Apron often teams up with other brands for fun meals (for example, weight watchers). 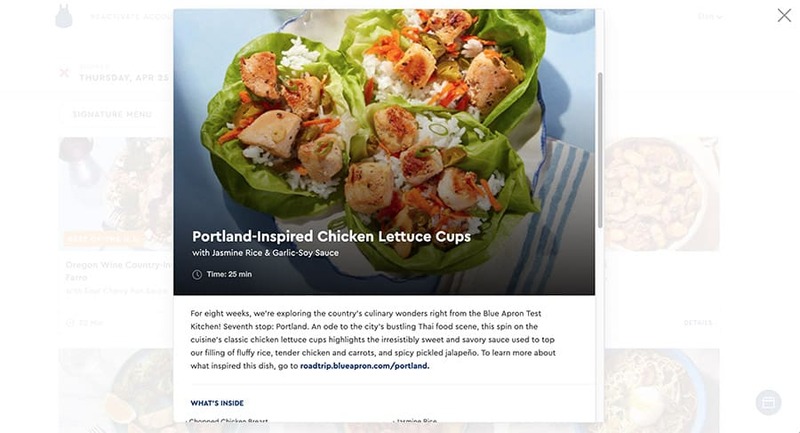 You want to be able to see cooking tips and recommendations from the Blue Apron community for each specific meal on how to make the dish taste best. If you have a specific question about either meal kit, feel free to let us know in the comments below! We’re happy to answer it.